Rhythmic gymnastics is one of the most beautiful Olympic sports. Only by practicing rhythmics kids can experience a rich variety of music, international dance styles, a “yoga level” of flexibility and breathtaking coordination. Tailor-made leotard designs, creative teamwork, exercising with multiple apparatuses such as hoops, ribbons, jumping ropes, balls and clubs and personality-infused routines will all inform your child's aesthetic and athletic education. 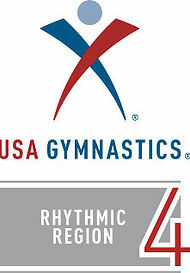 Everyone will find something to love about rhythmic gymnastics. Today, kids are challenged with a great deal of pressure at school, and many feel unsatisfied and overwhelmed after school day. Rhythmic Gymnastics after-school activities help kids shake off pressure and express themselves in our supportive and friendly environment. Not all kids will become champions, but all deserve a chance and support to try to compete by gradually building self-confidence, and we will be there to support and guide them. At Rhythmic Angels®, we have small classes with maximum 6 girls for ages of 3-6 and maximum 8 girls for ages 6-9, which both work perfectly for beginners. This approach allows us to better interact and develop individual rapport with every student. I am a young mother myself and know well how important it is to approach each child with care and love. Classes for kids as young as 3 (three)! Learning splits can be fun!